As a photography junkie I’ve long been fascinated with the way that three-dimensional imaging has paralleled the history of the medium from the early stereographs through the Viewmaster toys I grew up with (and which my son still played with in his preschool). 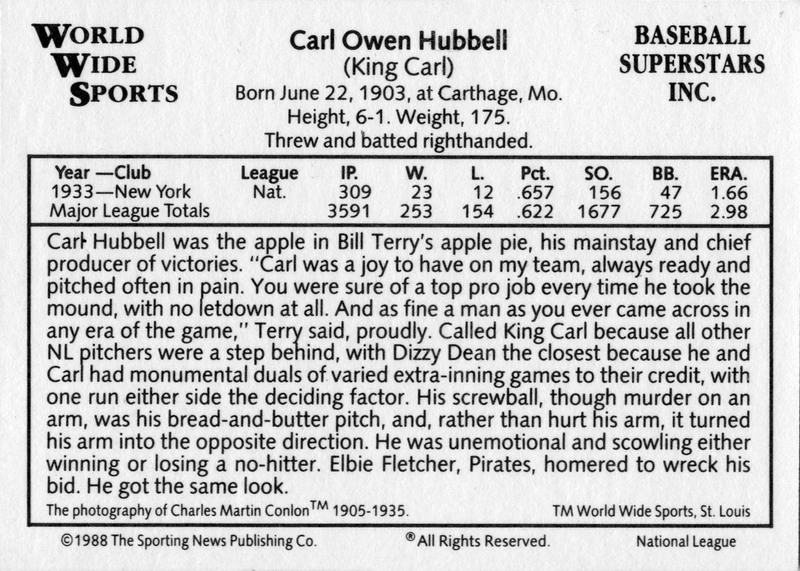 That baseball cards have multiple examples in these genre* is fantastic. But it’s the application of lenticular printing to baseball cards in the late 60s with the 1968 Topps 3D release followed by the run of Kelloggs cards starting in 1970 which is particularly awesome. Between the Kelloggs 3D cards in the 1970s and 1980s Sportflics magic motion cards, I’ve found myself developing a specific weakness to lenticular baseball cards and their low-tech magic. I’m not explicitly chasing sets of these but they’ll always turn my head and getting samples of all the different sets* is something I’m enjoying doing. I only have a couple samples of 1970s Kelloggs so far but each and every one is a joy to get and hold and look at. *Well besides the 1968 Topps 3D sets which is just insanely expensive. Most of the time I’m able to keep things in-line with my main collecting interests but this is not always the case. For example, last summer Topps released an On Demand 3D set. I normally ignore their on demand offerings since even the nice ones seem to only feature the same handful of teams and players. Plus they rely a ton on design reuse but usually do an even worse job of executing the old designs than Heritage does. Lenticular 3D though? Of course I bought a pack. I wasn’t expecting to wait quite as long as I did but they finally arrived the week before Thanksgiving. It was awesome. While it would’ve been nice to get some Giants I’m not even upset that I got Cutch as a Yankee. They look great in hand and I’m kind of regretting not buying more than one pack. The only disappointment (and it’s a small disappointment not a major critique) is that the action cards only show two frames of movement. I haven’t had a ton of experience with lenticular 3D cards and the ones I do have are kind of fragile due to the all-to-common cracking issues caused by aging plastic and differing rates of expansion due to the way paper reacts to ambient humidity and temperature much more than plastic does. So this is the first time I’ve had a chance to take a really good look at them. One obvious note to make compared to the older cards is that the current 3D cards depict action and the 3D effect works really well on pictures where the pose has considerable depth to it. I really like the Carlos Martinez for this reason and even in an animated gif it pops. I hadn’t thought much about the physics of the lenticular effect before either but making these gifs made me realize that the lenses have to go up and down in order to create the stereo effect. While tilting the card is the only way to get the impression in a gif, the vertical lenses split the image into two. As a result, each eye sees a slightly different picture and your brain assembles the result in 3D. Which means that I’m surprised and impressed that Topps printed horizontal cards in this set since that means they had to do two distinct print and finishing runs in order to accommodate the two designs. Of course this also means that I’m a little confused by the choice to do action with vertical lenses since every other lenticular action card I have has horizontal lenses and has to be tilted up and down for the effect. From Sportflics to Topps Screenplays, they’re all animated with vertical movement. The current Topps action cards are the first lenticular action ones I’ve seen that get tilted left/right instead. As I think about it, tilting up and down for action makes a lot of sense since you don’t want to confuse the eyes with combining two distinct action images into single still image. Which may be why the current action cards feature only two frames. Any more frames and your brain will try and combine adjacent frames into a 3D image instead of seeing things as action. Note: that all the motion holograms I’ve see have been left/right tilt—suggesting that our eyes/brains process them differently than lenticular images. And I guess that makes sense too since holograms are 3D no matter what angle you view them at. Author njwvPosted on December 3, 2018 Categories Modern, Oddballs, Topps8 Comments on Topps 3D! A couple of years before Pacific’s Spanish-language set, Kellogg’s had two 10-card sets which you could find inserted in boxes of cereal. This set was issues in both English-only and bilingual English-Spanish versions. Neither of those was distributed in my neck of the woods as the Kellogg’s boxes around me had Sportflics-manufactured 3D cards. Presumably the bilingual cards were distributed in more markets that had more Spanish speakers. Anyway, the 10-card checklist is an interesting mix of big names we still recognize (Clemente, Carew, Cepeda, and Miñoso) and others in the hall of very good who have name recognition for a certain generation of fans or for fans of a certain team. I know Kellogg’s was limited to retired players but I feel like they could’ve done better. Aside from how Cepeda is pictured with the Cardinals on the card front and the Giants on the back, I’m fascinated about what’s translated and what’s not in the text. Position information: “primera base” is Spanish, “DH” is English, and “BR” and “TR” stand for bats right and throws right. * His birth information: bilingual. Stats though are another mix just like the positions. Años is in Spanish but all the abbreviations are in English. *Took me a while to figure that out as I briefly thought that BR and TR were somehow representing other positions he played. The bio text though is basically equivalent between both languages. I enjoy that his nickname gets translated while the “El Birdos” cheer doesn’t have the same effect when the surrounding text is Spanish. Where the previous post covered Pacific’s “flagship” Spanish-language sets, this post will touch on some of their other Spanish-language sets. This isn’t meant to be a definitive list but rather a recognition that Pacific had other, smaller sets—general release, inserts, oddballs, etc.—which were also aimed at a Spanish-speaking market. These are what I’ve encountered so far and I know there are many more issues out there. From what I can tell the 1997 Gems of the Diamond is a 200-count insert set for a 150-count base set—in this case Pacific Prisms. 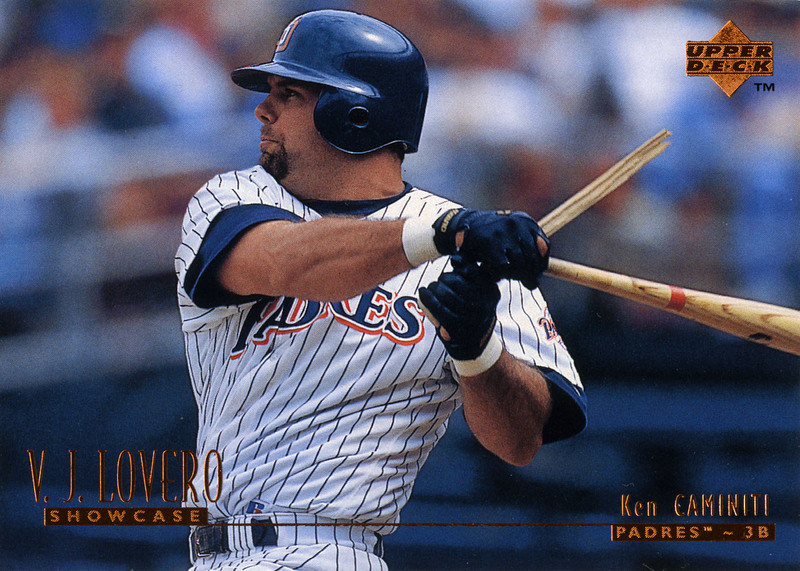 In 1994 Prisms were the insert set but from 1995–1997 Pacific Prisms was a 144-card set with all kinds of crazy stuff going on on the fronts and a sentence in Spanish about the players on the backs. In 1999 the mark returned but as an English-language set. In many ways the Gems of the Diamond insert set is more interesting from a Spanish-language point of view since it includes a lot more text about the players. 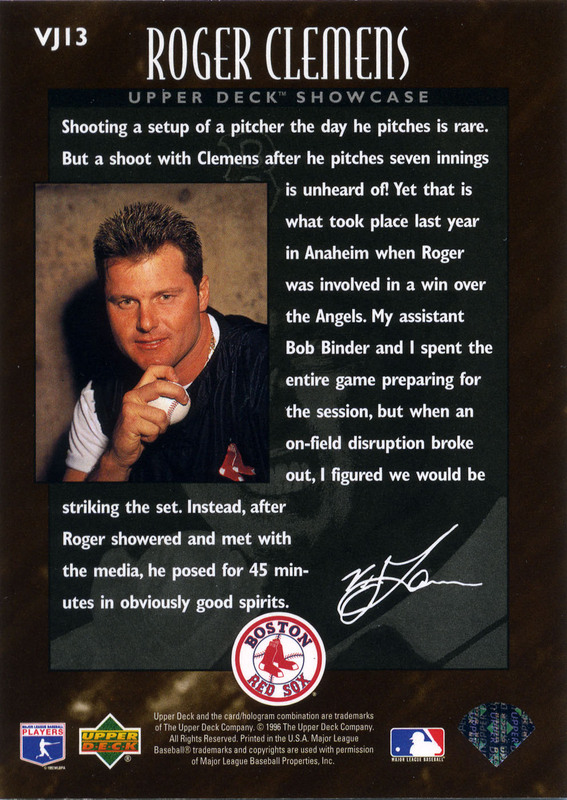 The copy on this Bonds card interests me because it feels like it was written in English first and then translated to Spanish since it uses evocative words like “smacked” and “tallied” in English while in Spanish it just repeats “conectó” (literally, connected) when describing his home run hitting. In 1998 the Gems of the Diamond set became an insert for Pacific’s Invincible line. This was the same deal as Prisms where the insert set outnumbered the base cards. * It looks like Invincible took over from Prisms since the invincible line ran from 1998–2000 and featured a different flavor of over-the-top designs. Less biographic text this year and there are now stats on the back. Stats are in English which really stands out when the text references them in Spanish. While I don’t have any of those tricked-out Prism cards I do have some Invincible cards. This one from 1999 has a weird translucent circle which features the player headshot so you can see him in mirror-image on the card back. Or maybe the point is you can hold the card up to the light and get a bit of a slide effect. I don’t know. I don’t have much to note on the Spanish language usage here except to point out that the positions are in English. It’s weird, in many ways Prism and Invincible are both cards lines which would be better served by not having any text on the backs and just embracing themselves as two-sided graphic design. The only reason to have text on many of these is so you know which side is the front. Be still my beating heart. In 1998 Pacific partnered with Nestlé on an oddball set. I’ve been unable to find out much about how the set was released but it’s a pretty good checklist featuring twenty Latino stars. Five of the cards are a distinct design and function as something like inserts. The fronts don’t scan well because of all the foil but they’re distinct among all the cards I’ve seen in having bilingual position information. This is a pretty regular feature on Pacific’s backs but is a lot of information to include on the fronts. Sadly the team names are the English version as I would’ve loved to have had a Vigilantes card instead of a Rangers card. 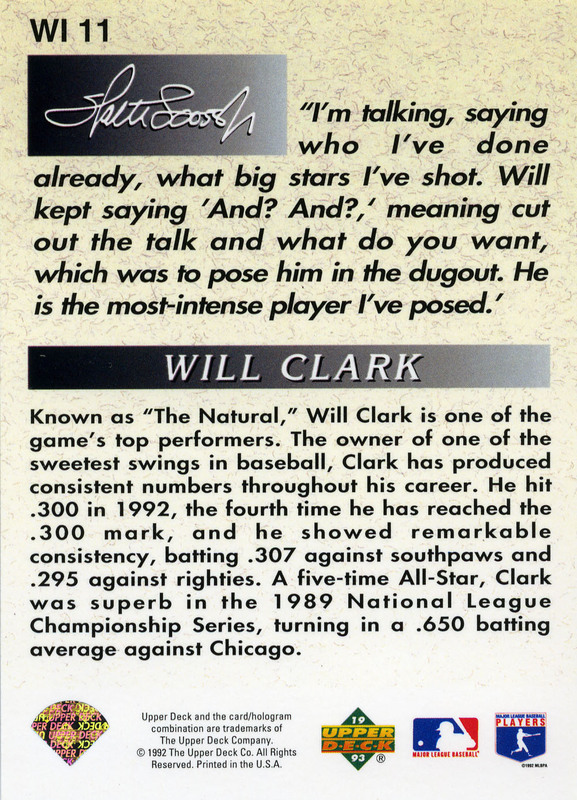 The backs meanwhile continue to feature English-language stats. Given the size of the type being used for the statistic categories this is kind of a disappointing use of space and it would’ve been fun to see bilingual stats here too. The other fifteen cards are what I guess you’d call the base design. No position information on these fronts and the same huge English-language stats on the back. I do appreciate how the smaller, italic font is used for English though. Still readable but very clear these are primarily for the Spanish-language market. As much as the 1980s is denigrated as the beginning of the decline into junk wax, over production, and, to a certain degree, the ruin of the hobby, it’s also the heyday of the regional oddball. One of the best parts of this hobby is being introduced to new regional oddball sets through people sharing things on twitter, blogs, etc. I’m not one of those people who tries to collect a little bit of everything. Instead I just enjoy seeing how many different sets were out there and the diversity of designs they offered. A week or so ago I encountered a sample of the Mets Fan Club cards on Twitter. As someone who grew up in the San Francisco Bay Area, this was something I’d never seen before* and my reaction went from “oh interesting” to “holy crap” as I looked at the photos. *Mother’s Cookies? Yes. Most other regional oddballs? No. Especially the one of the card back. In general, baseball cards backs don’t get the respect they deserve from either card companies or collectors. Yes, many of us grew up and learned our stats from there. But many of us also also stored cards back-to-back in binders and only checked backs to confirm whether or not the card was a rookie card. * Card companies meanwhile know that the card fronts are what move the product;** as a result it’s rare to see a back which has been considered seriously. *Now get off my lawn. **This is confirmed by the way modern chase cards have backs which consist of just “congratulations, you’ve found a certified relic/autograph/etc.” and no other useful information. Oddballs and regionals are frequently extra bad here since the backs often involve branding or demonstrate that the people making the cards have only a passing understanding of what’s supposed to be on a card back. My jaw hit the floor when I first saw the backs of the Mets Fan Club cards. They’re good-looking backs just in general. Besides being a strong design thought they’re extraordinary both in terms of their ambition and their execution. First, the ambition. The text is set in a parallelogram-shaped box with a slanted baseline. The angle of the baseline was selected so that the ascenders on the italic font become vertical again. This isn’t straightfoward to do with computers and I can’t imagine doing mechanically by hand. It’s an impressive stunt on its own. That this text grid is continued into the statistics panel is what blows my mind. Stats are hard enough to do well as it is. Just getting the numbers to align correctly is something that companies frequently mess up. * Doing it on a grid like this? You’ve got to be kidding me. Whoever laid this out was challenging themselves in ways that go far beyond the expectations for the usual baseball card backs. *One of these days I’ll write a post about typesetting statistics. That the execution of the backs is as good as it is is a testament to the skill of the designer and typesetter who put these together. There are still a few weird things like how the bold italic font has characters at a slightly different angle than the text font. But everything else including how the Innings-Pitched statistics head is aligned so that the decimals hang is done to near perfection. And that doesn’t get into other wonderful things like the use of the Mets’s colors as the two spot colors and the way that the Mets logo interacts with the bare paper in the top box. Even the card numbering with the single non-italic font on screened-back orange ink in a circle that fits perfectly into the corner of the box feels intentional and correct. I do have to point out though that while I applaud the ambition, typesetting multi-year stats ended up being too difficult. 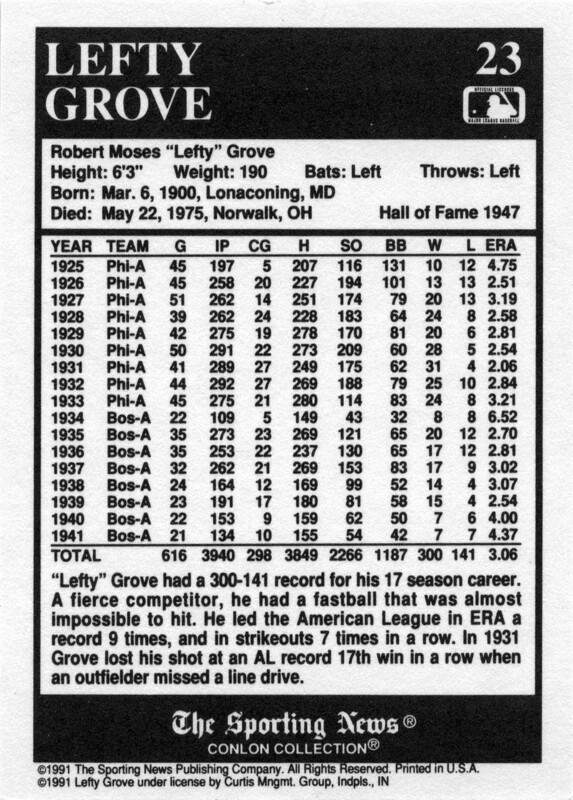 Davey Johnson’s card is having problems getting the verticals to line up. This also occurs in the text but it’s especially obvious in the stats where everything bends to the right as you go down the columns. That this card is not nearly as well-done as the rest shows how much manual work went in to making all eight cards in the set. Each card’s type is set slightly different in a way that never happens with computer typesetting. I love these because of what they intend to do, how they do it, and even the way they fail. It’s exciting to see designs which are inspired by the text itself—in this case the angle of the italic font. I just never expected to see this kind of thing on a baseball card back and I’m glad baseball card twitter continues to surprise me with things I never knew existed. A while back I received a package of Tampa Bay football cards. 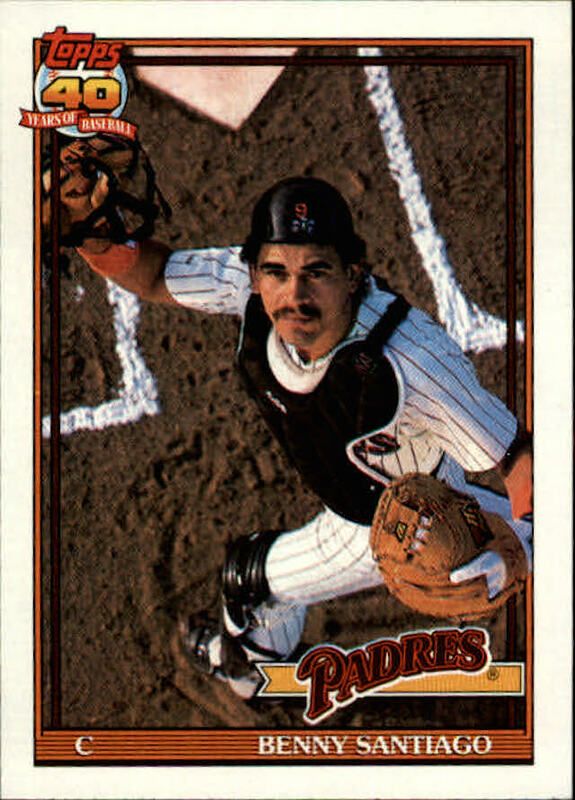 One of the cards in it was a 1991 Spanish-language ProSet card and it got me wondering why I had never seen any Spanish-language baseball card issues. I grew up in the Bay Area and even as a 6th grader realized that learning to speak Spanish would be an important skill to have. I even occasionally listened to Tito Fuentes broadcasting Giants games in Spanish on KLOK but I never saw any of that creep into my baseball card hobby. So I resolved to start looking for non-English cards and Spanish-language cards in particular. The only non-English cards I remembered were the French/English O Pee Chee and Leaf cards from Canada. Those were cool but very clearly weren’t intended for the US market and as I’ve thought about the novelty of the 1991 Spanish ProSet card, I realized that it was the idea of releasing Spanish-language cards explicitly for the US market which most interested me here. So while I learned about of the Venezuelan Topps cards,* they weren’t what I was looking for. *Which are very cool and also up my alley. After asking the Twitter hive mind and searching through the Standard Catalog I started to put a list together of sets and things to look for. Some of the cards (or card-related ephemera) like the 1972 Esso Coins or 1989 Bimbo Discs are from Puerto Rico and, like many other things Puerto Rican, fall into a grey area where they’re both part of and completely distinct from the US. That these two sets are also either impossible to find or ridiculously expensive when they do pop up encouraged me to further limit my search to cards released just in the continental US. 1993–2001 Pacific, Pacific Crown, etc. *There are also a few Topps Now Spanish-language cards from the 2017 World Baseball Classic. They’re neat but are Spanish-language variants of specific cards rather than a general Spanish-language release. So those are more akin to the occasional per-player Japanese-language variant releases for me. I’m sure there’s more. I’m pretty also sure that I didn’t miss much. I’ve been going down this search list and grabbing cards which also fit my other projects since I don’t want or need complete sets of everything. And in the process I’m enjoying seeing how the companies are creating and designing cards for a segment of the US market which obviously doesn’t get a lot of cards marketed specifically for it. I also plan on posting about the different sets on here. There’s a lot of interesting stuff going on and through both their target demographics and the way so many of the sets fall into that post-strike period of baseball history a lot of these sets don’t appear to be that well known. The Topps Zest is in many ways the perfect way to start this series. It’s a small five-card set which predates the rest of the sets by a dozen years but it covers many of the things that I’m noticing in the other sets. But first, some background. This was a promotion aimed at the Spanish-speaking market with a mail-in coupon which was completely in Spanish. Mailing Proctor & Gamble the redemption certificate along with the wrappers from two bars of Zest bath soap got you the set of five cards in return. It was a short promo too—August 1 to November 1—so you only had three months to take advantage of this. 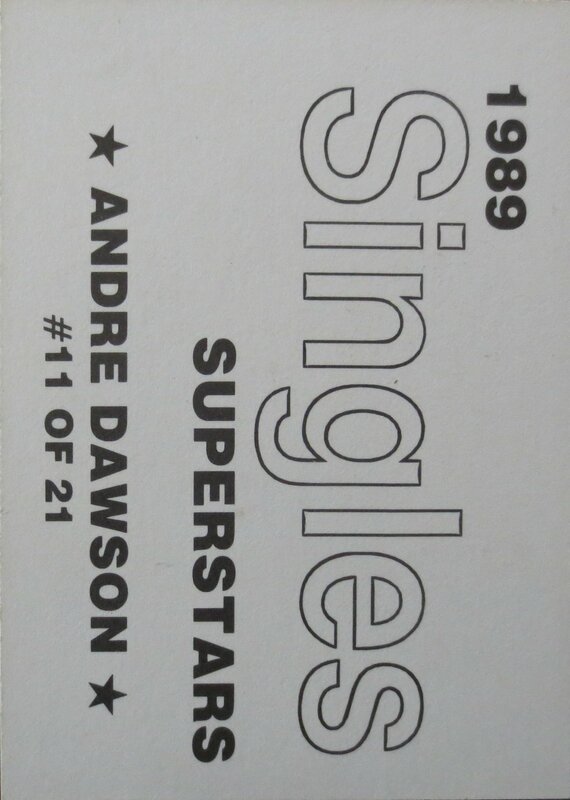 The front of the cards are mostly indistinguishable from their 1978 Topps base cards. 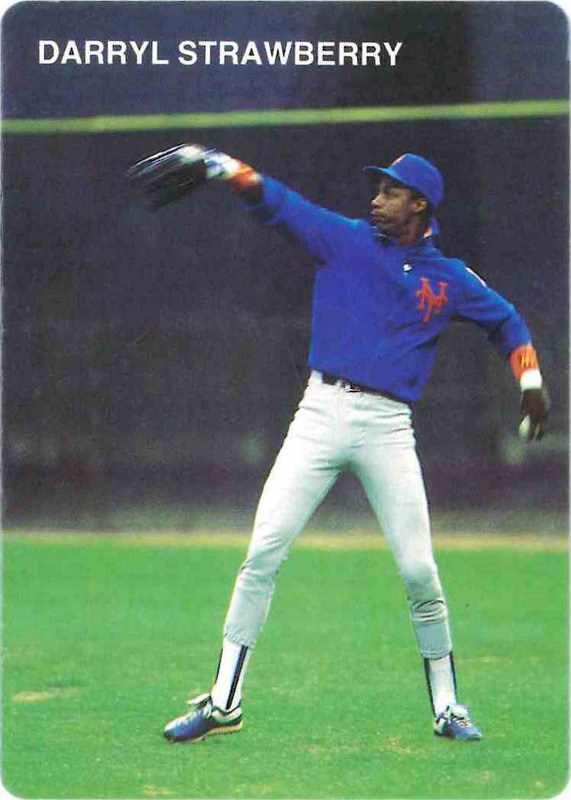 Eagle-eyed readers who know their 1978 cards will recognize that Topps updated Willie Montañez’s card with both a new photo and team to reflect that he was traded from the Braves to the Mets. My eye caught instead how Topps didn’t change the position abbreviations. Joaquin Andujar is a Pitcher instead of a Lanzador and Manny Mota is an OutFielder instead of a Jardinero. 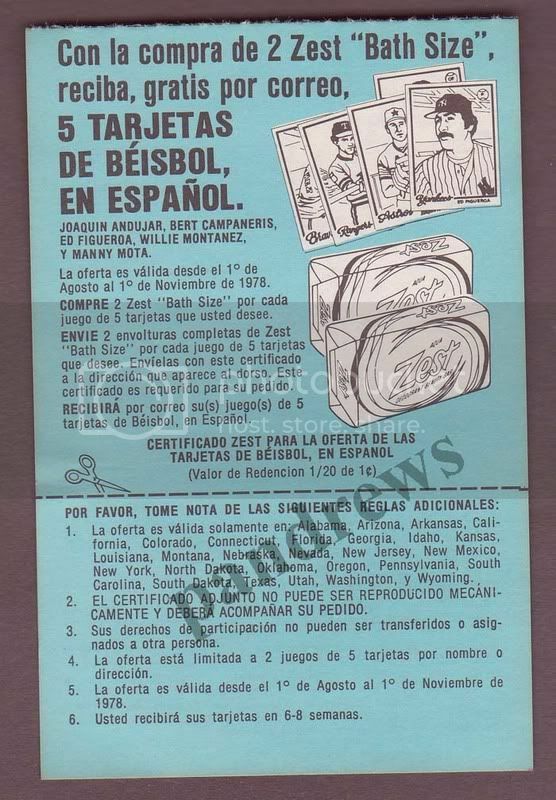 The backs are where things get interesting because of how Topps made them bilingual. Again it’s Montañez’s card which deserves the most attention because of how Topps added the tilde to his last name* in addition to the other translations. 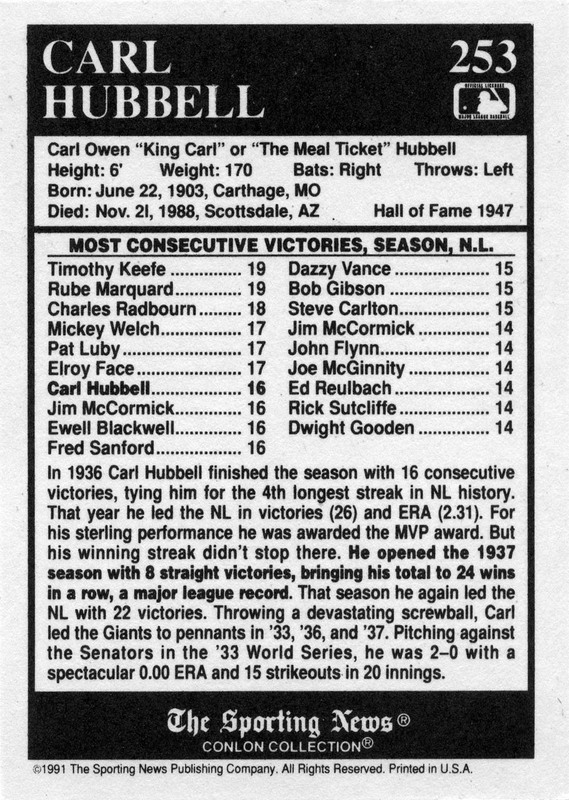 I also can’t help but look at the statistic headers to see how the different stats got translated—or how in the case of Batting Average Topps still used .AVG. *Some early #PonleAcento action and the reason why I’ve been writing his name as Montañez in this post. One of the nice things about a statistically-heavy back is that since numbers don’t have to be translated, fitting everything in isn’t too bad. When there’s more text on the back like with Ed Figueroa’s card, the designer has to figure out how to avoid things getting too confusing. This appears to have involved working with the translator to create text which is about the same size in both languages as well. I found it especially interesting that while none of the team names were translated anywhere else on the cards that Red Sox did get translated as Medias Rojas on Figueroa’s. 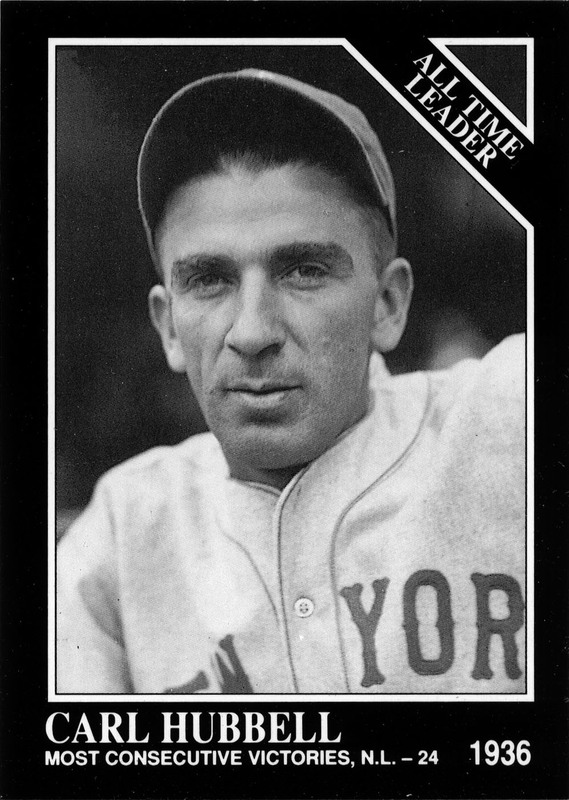 The Conlon Project reminded me that despite being in many ways about photography, baseball cards almost never credit the photographer who took the photo. While we can often figure out which cards were shot by the same photographer based on the location, putting a name to that photographer often required putting the pieces together from other media. We know that Richard Noble’s portrait of Bo Jackson was used in 1990 Score because of his lawsuit against Nike. 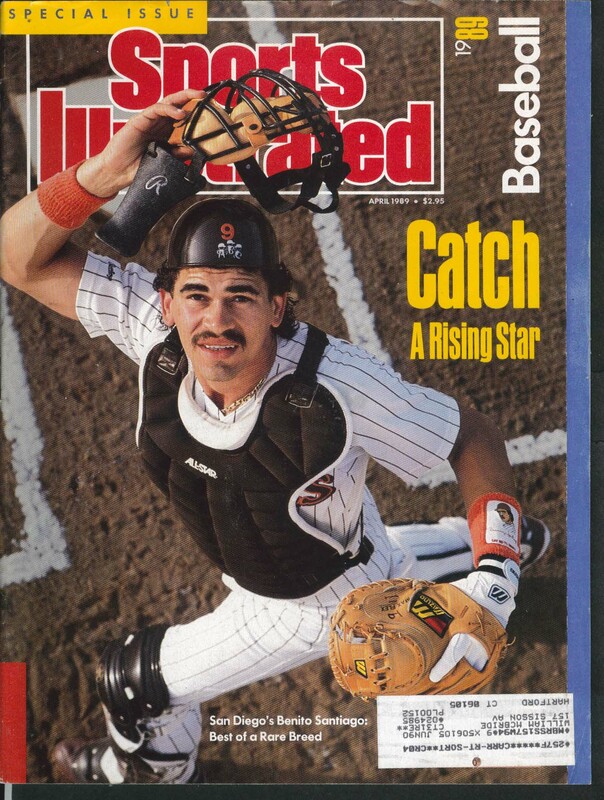 And we know that Ronald Modra shot the photo of Benito Santiago in 1991 Topps because Sports Illustrated used a different photo from that session on its cover. But there’s no credit on the cards themselves even though anyone can see that they’re above the usual standard of baseball card photography. Where we did have photographer credits is in the Broder card realm. I don’t just mean Rob Broder’s sets either. There were a number of photographers at this time creating their own unlicensed sets—all of which are known in the hobby as Broder cards.And there are even some licensed photographers like Barry Colla whose sets have the same “Broder” look and feel. On the surface these cards look very similar to each other and remind me of Mother’s Cookies* with their emphasis on the photo and the plain Helvetica text. *I’ve been led to understand that Colla shot a lot of the Mother’s photos. Often the photo is more of a function of someone who has access to a telephoto lens and a field-level press pass. It’s nice to see these photos but most of them aren’t anything portfolio-worthy. Sometimes though they’re clearly part of a portrait session and those are much more fun to see. Even if they’re standard baseball poses the portrait session is a more accurate gauge of the photographer’s abilities. The backs remind me of the backs of mass-produced 8×10 photos. Name and numbering and not much else. * So they’re more like 2.5″×3.5″ photos rather than baseball cards. 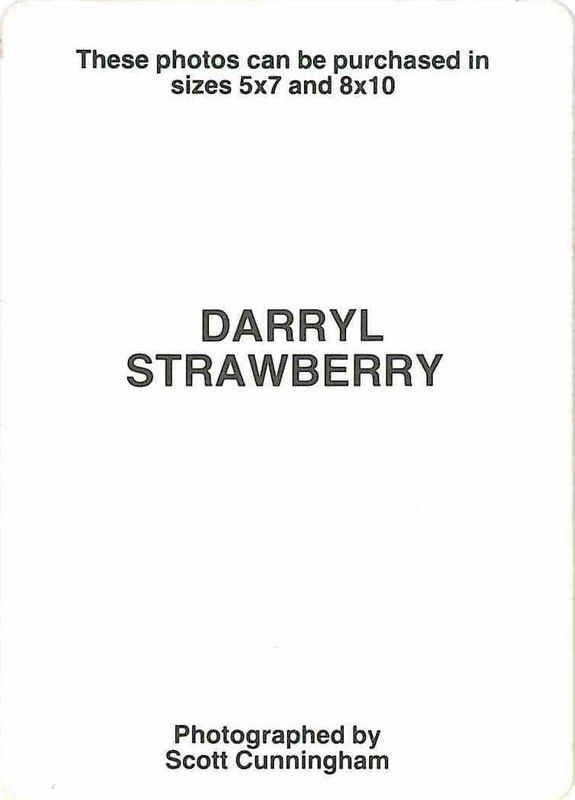 In many ways this makes them a wonderful artifact of the 1980s/90s freelance photography hustle where self-publishing was a feasible approach amidst the junk wax boom. 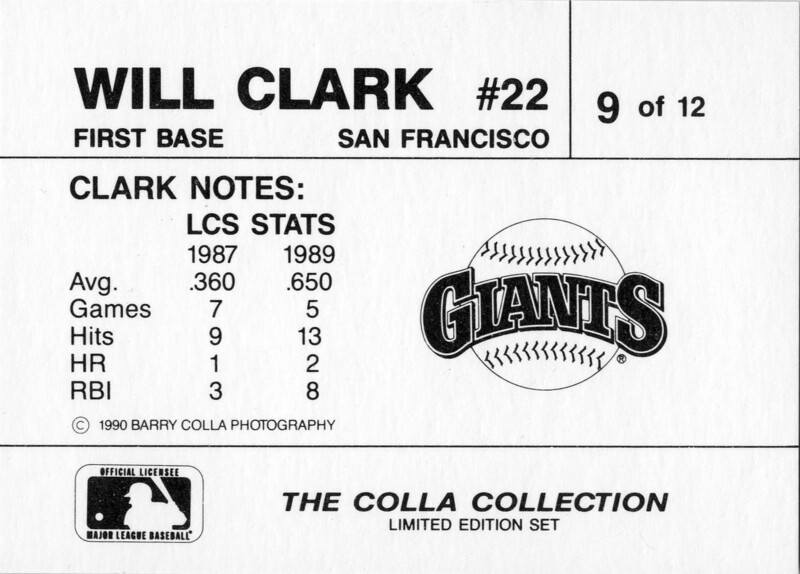 The Barry Colla cards at least have some more information but the overall design still feels like an afterthought. *That this is so close to my self-designed backs suggests I shouldn’t give my nine-year-old self such a hard time. All of these sets—if you can call these packets of a dozen or so cards sets—were very much created to capitalize on whoever was rising on the Beckett hot list. Multiple cards of the same star player. Hot rookies. I’d snark more but it cuts very close to what I’ve seen going on with cards today where Topps is releasing an uncountable number of cards for Aaron Judge and Cody Bellinger. 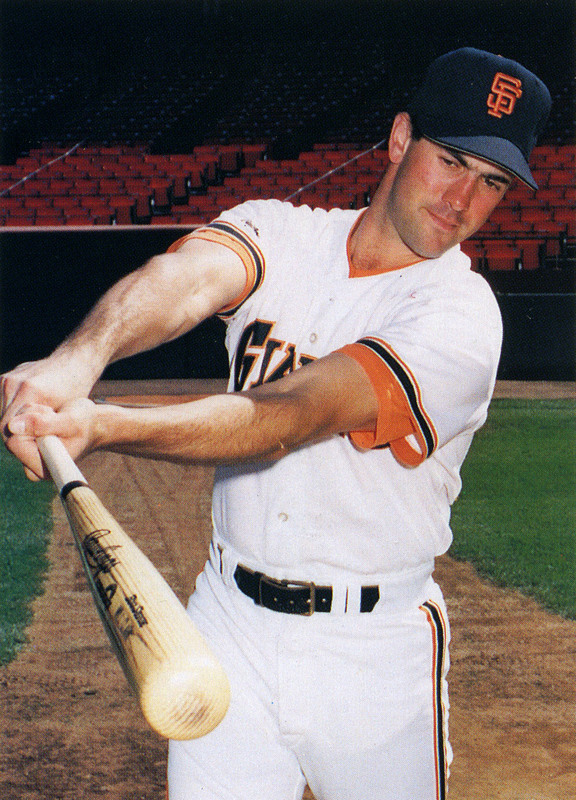 The Conlon cards exist in that same late-80s, early-90s ecosystem as the Broder cards. The earlier releases are very much in the same vein of treating the cards as photographs first and cards second. I very much appreciate how they’re printed as duotones* and it’s charming how the text is an afterthought and no one thought to even provide numbering. *Yes there’s a post with more information than you ever wanted about printing. And much to my surprise many of the cards Topps released in 2017 are actually duotones or use spot colors for the black and white images. By the early 90s the set has been redone as proper cards. More stats. More design. Set numbering. A large set count. In many ways they’re not really about the photo anymore. Which is a shame since one of the things I did as part of the Conlon Project was check out Baseball’s Golden Age from the library. 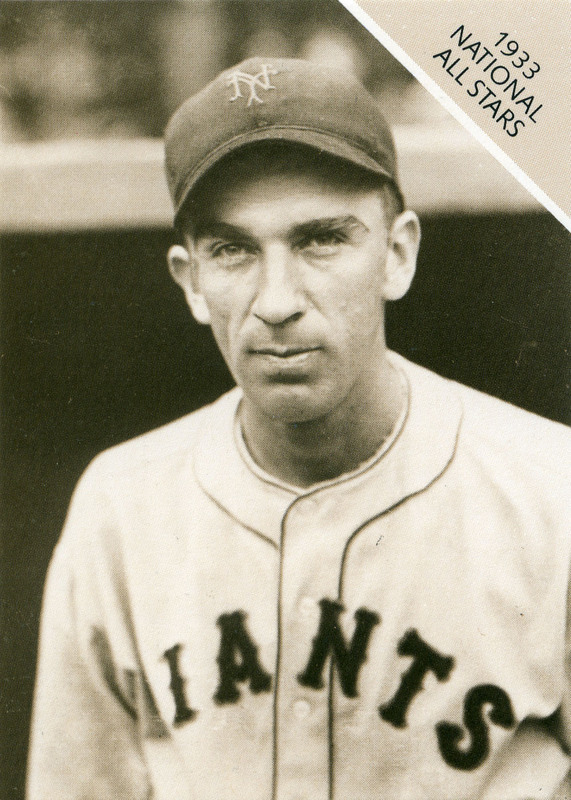 Where the Conlon cards have somewhat generic player information and stats on the backs, the book includes some of Conlon’s stories about photographing the players. 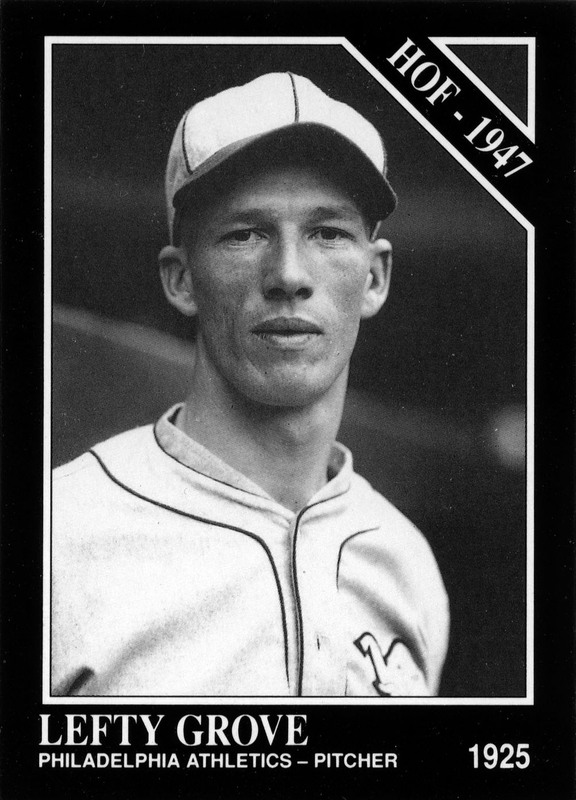 These stories—such as Lefty Grove refusing to let Conlon see how he gripped the ball or how in that famous Ty Cobb photo Conlon was more worried about the well being of the third baseman than whether or not he got the shot—are fantastic and suggest another approach that these photographer-based cards could’ve gone. 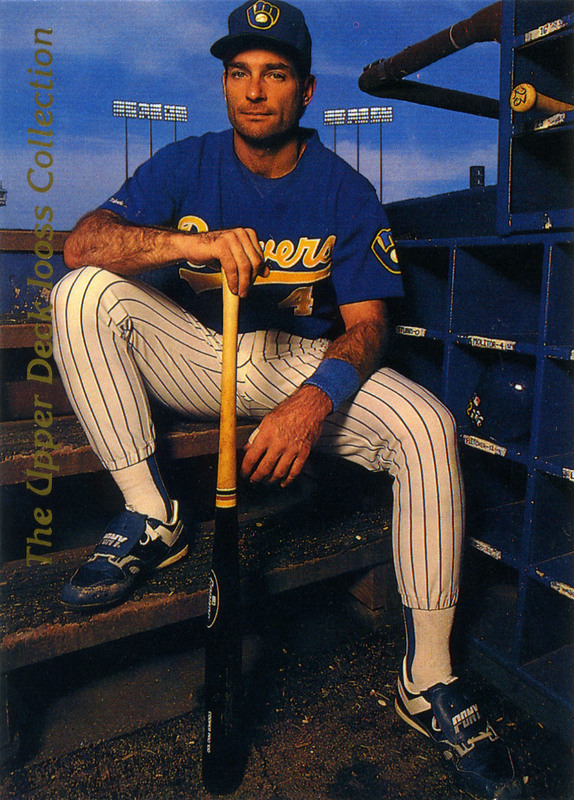 Thankfully Upper Deck did exactly this in 1993 with its Walter Iooss collection and again in 1996 with its V.J. Lovero collection. These cards are great in how they’re so clearly photo-focused* but also allow us to see how the photographer approaches the game and his subjects. 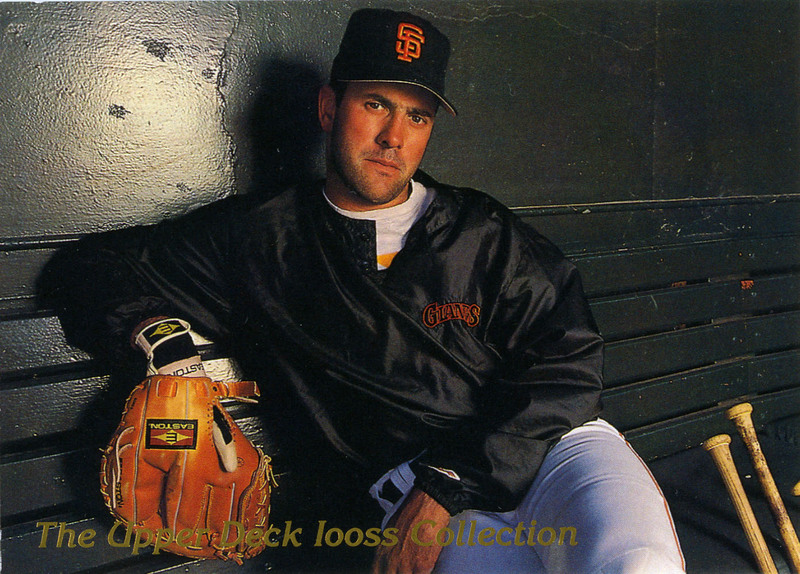 *Something that mid-1990s Upper Deck excelled at in general. The Iooss cards are also a wonderful demonstration of what makes Iooss’s work so distinct. The lighting relies on off-camera flash and underexposes the background. 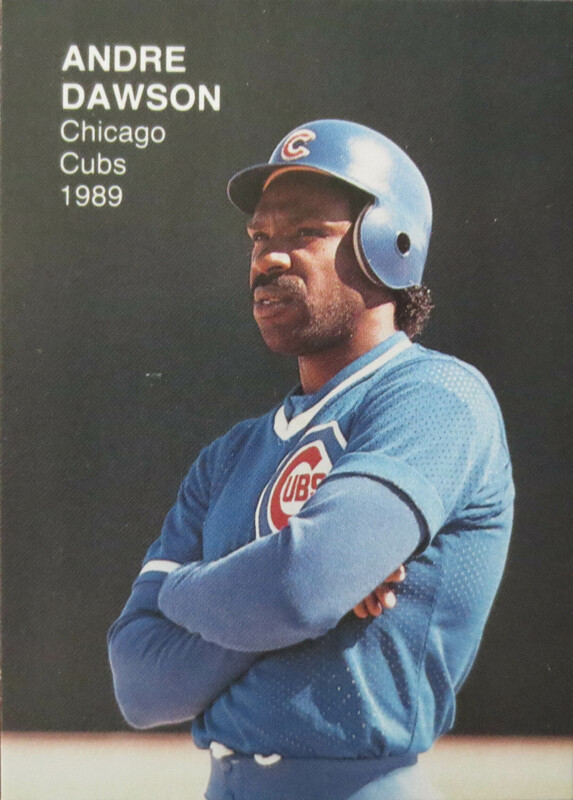 But unlike the “every sky must be dark and rainy” look that dominated Topps in 1985 and 1986, the Iooss photos balance the light temperatures well. The skies aren’t that weird grey blue color and the players all have a wonderful warm glow. And the stories are great. 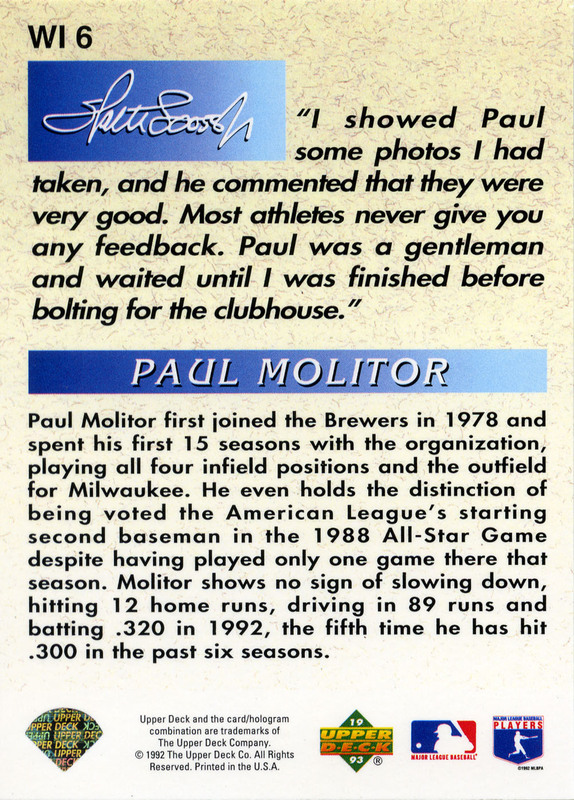 Most of them are interesting—Albert Belle’s refusal to pose and Iooss’s subsequent having to take an action photo stands out—but I like the comparison of Paul Molitor and Will Clark. Lovero’s photos don‘t have a clearly-defined look the way Iooss’s do. If anything it’s that they have a tendency to be shot extremely tight—similar to Topps’s current approach in Flagship except that I think Lovero shot this way and Topps just crops things this way. What I like about the Lovero cards is that their backs often get into the technical side of the photography. 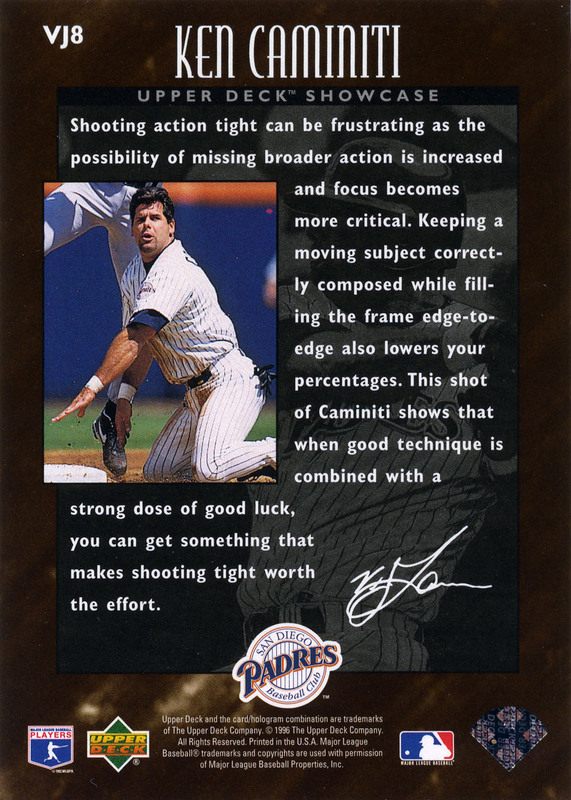 The Caminiti card talks specifically about how to shoot tight action. There are others that talk about trying different angles for shooting. Reading them you get a real sense of how Lovero approaches photographing baseball action. His stories about the posed shoots are closer to the Iooss stories except that they’re often about the context of the shoot rather than the player himself. 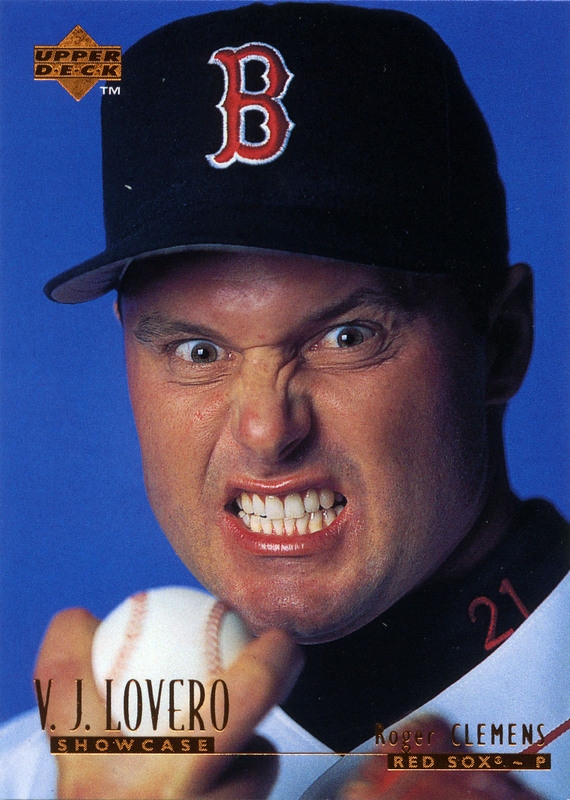 Combined though, both the Lovero and Iooss sets offer a wonderful look at how a professional had to approach sports photography in the 1990s and offer a lot of pointers to anyone who’s interested in shooting sports action now.